LOS ANGELES, CA - FUEL TV, the only network dedicated to the lifestyle of action sports, will be hosting the live HD webcast from the final day of the 2009 Tampa Am on December 6, 2009. 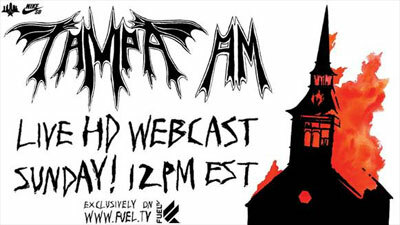 The webcast will run from 12:00pm ET to 6:30pm ET on FUEL TV’s web site www.fuel.tv. FUEL TV will feature the Am Semi-Finals, Am Finals, Best Trick Final and awards. The contest will also be recorded by FUEL TV’s production team and edited into a half-hour highlight show that will air on FUEL TV early in 2010. This is the second event of a multi-year partnership between Skatepark of Tampa and FUEL TV. FUEL TV presented the 2009 Tampa Pro as its first ever HD webcast back in March. For the 16th year in a row, the Tampa Am takes place at Skatepark of Tampa in Tampa, Florida. The Tampa Am is considered to be the top amateur skateboard competition in the world. The contest has exposed some of the biggest names in amateur skateboarding, including Kevin “Spanky” Long, Caswell Berry and Nyjah Huston. The webcast will be hosted by announcers Brian Schaefer, Ryan Clements and Vern Laird, with pro skater Neal Hendrix and industry vet Erica Yary reporting from the sidelines. FUEL TV continues to provide entertaining and exciting content to the action sports community through various media formats, and it’s recently produced several HD quality webcasts, including the 2009 Vans Downtown Showdown, the 2009 Maloof Money Cup, the 2009 Vans Protec Pool Party, and the 2009 Tampa Pro. FUEL TV is also offering selected full-length episodes of its programming in HD Streaming on its web site. Viewers can watch HD versions of shows such as “New Pollution,” “Firsthand,” and “Built to Shred” using the same HD player as is used for the 2009 Tampa Am webcast. Highlights of the Tampa Am will also be featured on FUEL TV’s “The Weekly Update” news show. Make sure to check out the FUEL TV webcast of the 2009 Tampa Am on December 6, 2009 from 12:00pm ET to 6:30pm ET. If viewers miss the webcast on December 6, they’ll be able to watch on a VOD basis. HD clips of the finals will also be available on the FUEL TV iTunes channel.